We recently covered 12 keyboard shortcuts to help navigate around and manipulate text in Mac OS X, and now we’ll show you a handful of similar tricks for use at the command line. These shortcuts can be used just about anywhere in the Terminal, including the bash prompt. Of course you can also use the arrow keys to navigate within text blocks and to place the cursor for using all commands mentioned. 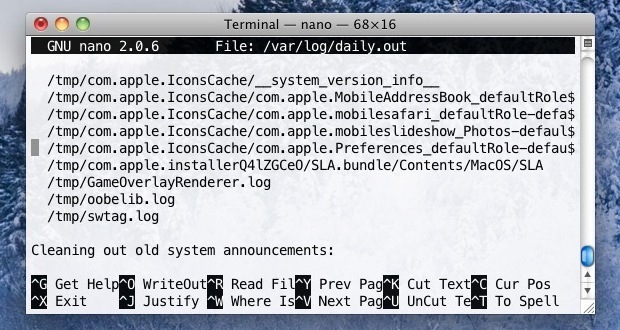 Because the latter two kill and yank commands do not overwrite the clipboard buffer, they can function as a secondary cut & paste command in many GUI based Mac OS X apps as well. Enjoy this? Check out more command line tips in our archives. Still really useful for anyone learning bash though. If you are vi/vim user put set -o vi in your .profile and then you can use vi key bindings to edit the command line. If you also add export EDITOR=vi in .profile you can hit ESC v to edit the long command line in actual vim. This also allows you to easily copy paste long command lines etc.